Average Down - What Does It Mean? 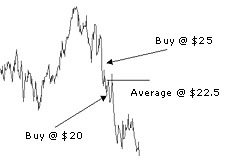 Averaging down refers to when an investor buys additional shares of an asset at a lower price than what they originally paid. This is done to lower the overall "average price" of their position. Joe Smith buys 1,000 shares of Microsoft at $25.00 per share. He believes in the direction of the company and has a great deal of confidence in management. The markets plunge, and Microsoft trades down to $20.00 per share. Joe Smith believes that the fundamentals in Microsoft have not changed, so he decides to buy another 1,000 shares of the company at $20 per share. Joe Smith has "averaged down" on his Microsoft position - he now owns 2,000 shares of the company at an average of $22.50 per share, instead of 1,000 shares at an average of $25 per share. Joe will now break even at $22.50 per share, but he owns double the shares. Warning: Always have a plan in place if you are planning on averaging down. Many people will average down in a stock because they are just too stubborn to take a loss - this is a sure recipe for disaster.